Led by Ashley Z. Hand, MOCK Studio is currently designing a collage to be featured in the upcoming RETHINK LA: Perspectives on a Future City exhibition at the A+D Museum in Los Angeles, CA. Selected architects and designers were chosen to develop a series of collages that represent a vision of Los Angeles in 2061. A series of 25 iconic photographs from around Los Angeles will be transformed into a vision of that same locale 50 years in the future. 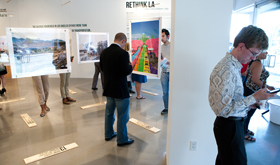 The exhibit poses the question that if we begin to implement sustainable policies today, what will LA look like? 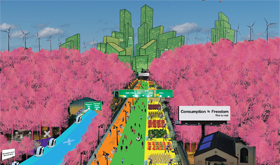 MOCK Studio’s vision of LA in 2061 is one with personal rapid transit, reclaimed freeways, infill development, and on-site renewable energy generation. 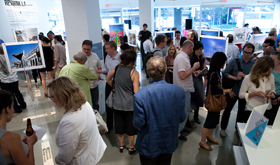 For more information on MOCK Studio’s role in the development of this exciting exhibit, please click here.